The guys in the second photo are LOL-ing so hard. That fish must have said something hilarious. That, sirs, is a ribbonfish. W0w that exists?!? Nice catch mates!!! Whatever happened to catch & release? Why can’t people let something so rare and beautiful thrive? Man is a destroyer and It makes me sick to see them laughing about what they’ve just done. I agree with jen myob. You have to realize that you don’t even go fishing for a fish like this. It was 1) a fluke that they caught this fish and 2) so stressful on the fish itself that it was going to die regardless of what they did. They aren’t rare, just rare for us to see, bcause they are normally exclusive to the extreme deeps of the ocean. It is a member of the ribbonfish family, and it is a king of herrings. They are known to get up to 37 feet long and about 600 pounds. Quit getting on the case of guys who just had a once-in-a-lifetime moment and go do research on an animal before you make an “I love animals and doing any harm to any individual is going to end the world” argument, and quit being ignorant. Well put Jaxon. Well put indeed. It’s a giant oarfish, a member of the same order as ribbonfish, not technically the same family, it is in the family Regalecidae whereas Ribbonfish are in Trachipteridae. Also Jaxon is right in saying they are a deep-water fish, most specimens that are near the surface are already dead or dying. Yes, if it surfaces it is already dying as it is not accostumed to the (lack of) pressure this high up. I have a theory they sometimes get forced up to the higher waters by underwater currents close to shore. It is a Regalecidae Glesne, mainly located in the northern hemisphere, between 300 – 1000 meters deep. It has no teeth and lives of small crustaceans and plankton. This makes it realistic to believe it can get quite old, since it can get so long. Normal size is three meters, (of the individuals found), but they can be ten meters full grown. Very few has been seen alive, and as far as I know, only one filmed alive, on the coast of California. It died soon after. It was first found floating ashore in Norway in the 15th century and is named after the area it was found in. Many stories of seamonsters come from seeing this wonderful fish which is the longest boned fish in the ocean. Some, of course, exaggerated. It has been said that it was called the King of Herrings because the Scandinavian fishermen usually saw it not far from herds of herring, and they believed it was leading them. as an oarfish. Take your own advice and do some reading. 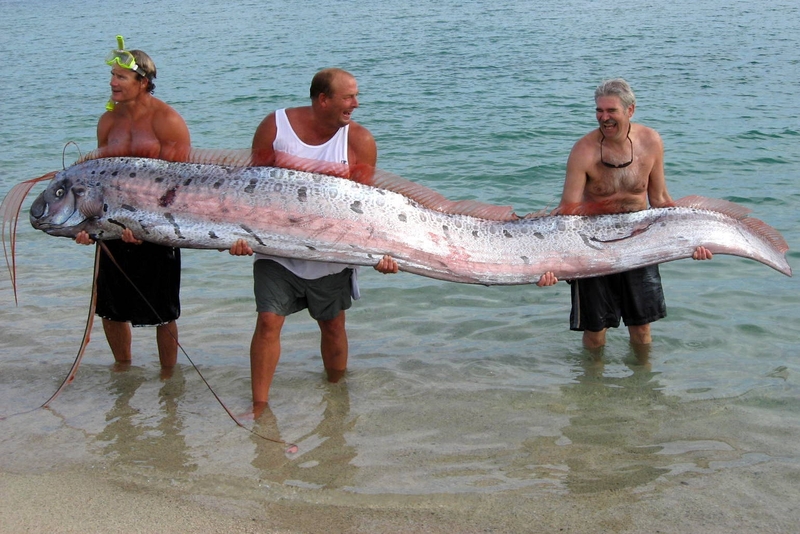 This fish, also known as the oarfish is the longest bony fish in existence. It is found in depths from 300-1000 meters in any of the world’s oceans. The king of Herrings remains in deep waters and does not surface often; typically if it surfaces, it dies when doing so. 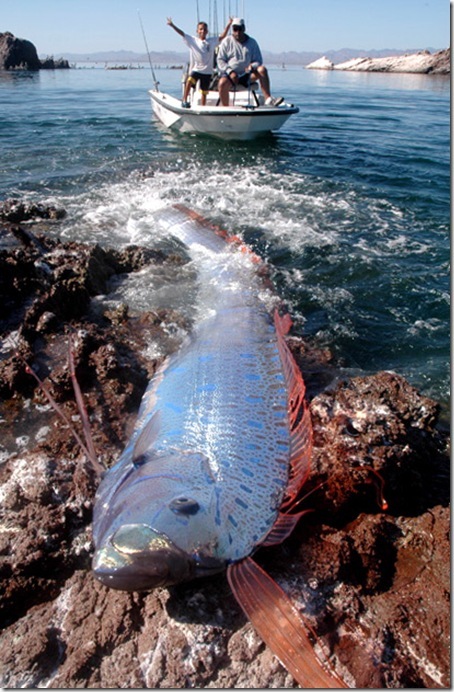 This 16 foot long fish was first discovered washed up dead on the shore in Bermuda in 1860. It is believed by scientists that the great myth of a sea serpent could have branched off of a king of herrings sighting. Despite that, this organism is a fish, it does not have any scales and although frightening in size, is not a threat to the human race based on its small teeth and one dorsal fin.